If you want to be able to connect to your organization’s network on your iPad, you may be able to use a virtual private network, or VPN. A VPN, which works over both Wi-Fi and 3G/4G cellular data connections, allows you to access data securely whether you’re using a network outside your company — such as at home or in a café — to access the servers inside your company’s network. After a VPN is set up at your company, you can use VPN settings on your iPad to connect to your company network. You might need to ask your network administrator for information on how to make settings for accessing a VPN. If you’ve set up VPN on your computer, you should be able to use the same VPN settings on your iPad. 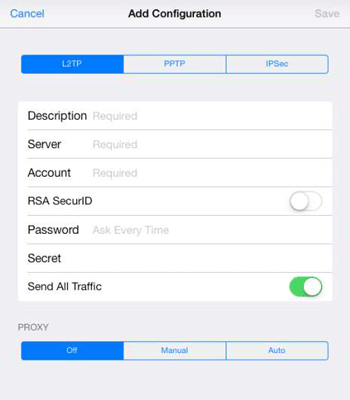 You might want to let your admin know that iPad can connect to VPNs that use the L2TP, PPTP, or Cisco IPSec protocol. To add a new VPN configuration, go to Settings and tap General→VPN→Add VPN Configuration. The settings appear. Fill in the information requested and tap Save. You can have multiple VPNs set up, for example if you consult with several companies with their own VPNs. Tap the one you want to use, and then set the VPN switch to On. To switch VPNs, disconnect from one, select the new one, and then turn VPN back on. Only one VPN can be active at any time. To delete a VPN configuration, tap the blue arrow to the right of the configuration name in the General settings and then tap Delete VPN. Have your administrator check out third-party tools that help to enable the use of the corporate network by remote iPad users. Good for Enterprise helps a user manage and update smartphone-like standards if that person’s company has no single standard. Array Networks provides the iPad app Desktop Direct – My Desktops that, along with Citrix Receiver software, helps users access their desktop from afar.